Wash kumquats and roughly chop them. It's okay to leave on the skin and leave in any seeds. They are soft enough to chew. Mince Serrano pepper (leave in seeds for more spice) and red onion. Add to a bowl with kumquats. Stir in minced cilantro, olive oil, and season with salt. Let sit for 30 minutes to let the flavors blend. The salsa is okay with chips but is really tasty on fish or chicken. Sometimes all it takes to get out of a food rut is a simple substitution. In this case, I’ve been in a salsa rut lately. Not that I don’t absolutely love standard tomato-based salsa, but sometimes I’m up for a change. Recently, I saw some wonderful kumquats in the store (they’re in season now) and so I thought it just might work to mix them with some other standard salsa ingredients. 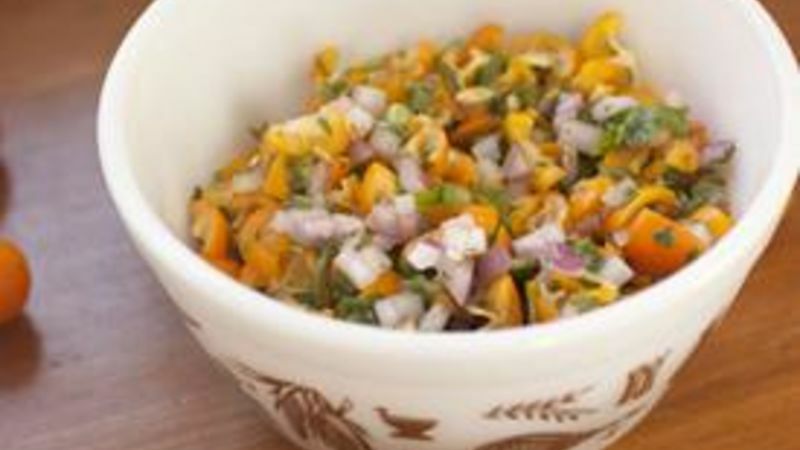 The resulting kumquat salsa has a sharp citrus flavor. It’s really bright and flavorful and works great as a topping for a bunch of different dishes. Honestly, I hadn’t eaten many kumquats before making this salsa so the first thing I did was just eat one whole. If you’ve never tried a kumquat, they are really flavorful for their size! They’re kind of like a cross between a lemon and an orange—almost too strong to eat on their own. You’ll need about a half pound of them for this recipe. You can just wash them and then chop them up. There’s no need to peel them or remove the tiny seeds. Just chop them up and add them to a bowl! Besides the kumquats, you’ll want some red onion, Serrano pepper, and cilantro plus some olive oil and salt for seasoning. Once everything is stirred together, it’s a good idea to let the salsa sit for 30 minutes or so to let the flavors all meld together. This is an incredibly flavorful and bright salsa. You can eat it with chips, but I think it needs something more substantial to really make it work. Personally, I think it works best as a topping for chicken or fish. For dinner one night I grilled some chicken and just topped each piece of chicken with a few spoonfuls of the kumquat salsa. If you’re a salsa fan, but feel like you’re in a bit of a rut, try this out. There are only a few ingredients and it takes just a few minutes to mix up, but the flavors are really surprising and delicious. Nick thinks that most salsas are better with lots of citrus flavor. Be sure to check out his blog, Macheesmo, his book, Cornerstone Cooking, and check out his Tablespoon profile.